I have a confession. Until a couple of months ago, I had never made pasta. Not once! So when I was invited by Hubbub to attend a pasta and risotto course run by Anna Colquhoun, the Culinary Anthropologist, I was delighted. Anna is living the dream many hobby food lovers harbour. She gave up a high level job to study at the Tante Marie Cooking School in San Francisco, and then took more specialised courses at other schools, including the San Francisco Baking Institute. This was followed by internships at a number of restaurants including Alice Waters’ famous Chez Panisse in Berkeley. 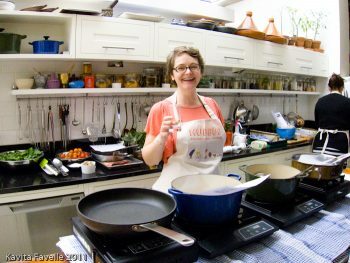 Anna and her husband Matt then embarked on a year of travelling around Europe, Turkey and North and West Africa, soaking up all they could learn about cuisines as varied as Spanish, Slovakian and Senegalese. Anna researched and learned as much as she could about how to cook the food she and Matt encountered. On getting back home, she was asked to author Alistair Sawday’s Eat Slow Britain, relating the stories of 88 British food business from pig farmers to cheese-makers to bakers to vegetable growers to restaurants and more. All had in common a shared belief in slow food values. And she also converted her home kitchen into a large welcoming space that is perfect for the small-group cooking classes she now runs. 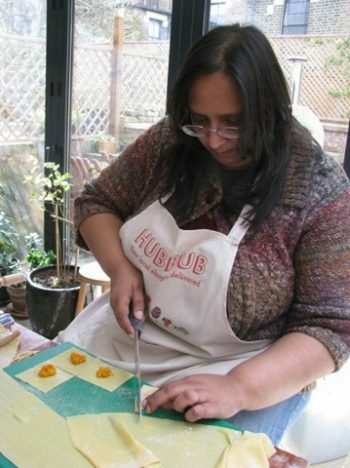 Hubbub, based in the Arsenal/ Finsbury Park area, are a small business aiming to help Londoners make use of their local independent food suppliers. Customers can order via Hubbub from local shops currently including Frank Godfrey Family Butcher, Fin & Flounder, Earth Natural Foods, La Fromagerie, Saponara Italian Delicatessen, The Barnsbury Grocer, Hansen & Lydersen, Paul A. Young Fine Chocolates and Ottolenghi. The advantage to the customer is that, instead of paying delivery charges from all the invidual stores, Hubbub arrange collections, collate your order and deliver it to you in one go, and for one charge. At the moment, much to my dismay, they don’t cover North Finchley – their range is most of Highbury, Islington, Finsbury Park, Stoke Newington, Tufnell Park and Kentish Town. But they plan to roll out their model further afield, so I’m keeping my fingers crossed! 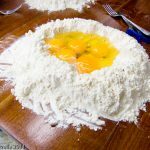 We started a little late, but after a quick introduction from Anna, we got stuck in, starting by each making our own pasta dough (see recipe below). Anna favours doing this traditionally, by hand… which involves making a caldera of flour, breaking the eggs into it and then carefully mixing flour from the inner caldera walls with the eggs, without causing a breach and having the eggs escape! After what seems an age, the dough finally comes together, though it’s a really hard dough, and kneading it is difficult. This is where experience is so important – Anna assures us that a hard dough is not a bad thing, and that it’s actually helpful, since the dough will soften and become much more elastic after resting. Somewhat dubious, we each divide our dough into two pieces, wrap in cling film, label with our names and leave to one side to rest. Whilst the dough rests, we make two fillings, one of ricotta and herbs and another of roasted butternut squash and parmesan cheese. We split into two groups for this, each group making one of the two fillings. Fillings done and popped into the fridge, we retrieve our pasta dough. And just as promised, when we open them up, mine has just the right texture – soft and elastic yet firm. Anna teaches us how to press our dough through the hand-cranked pasta machines and we’re grateful we’re in teams, as turning the crank, feeding the long ribbons of dough in and gently catching them as they come back out takes more than two hands! If the dough gets too sticky, we sprinkle with flour, which it absorbs as it goes through the press again. But if it’s dry enough, we simply use a little semolina, less finely ground which means it doesn’t get absorbed into the dough so easily, and that stops the folds of dough sticking, but can be brushed off the surface easily when ready. Some of the dough we cut into maltagliati and some into papardelle. 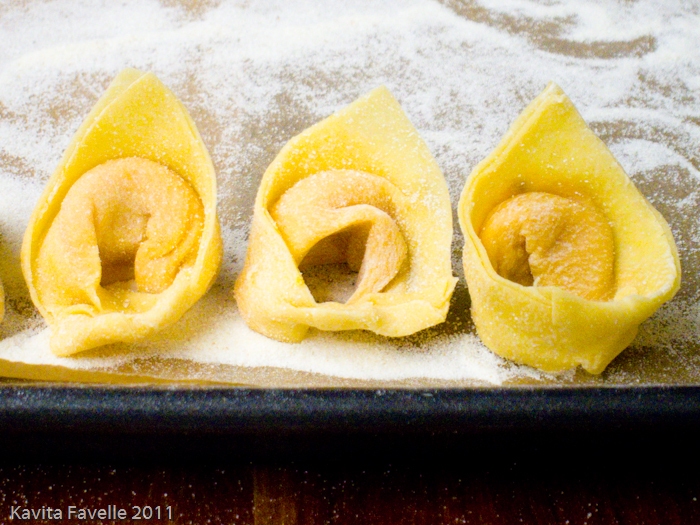 From the rest we make ravioli and tortellini, learning how to remove air bubbles, seal and shape. The finished pasta is left to one side while we move on to make two risottos, a wild mushroom one to be served with truffle oil and a pea and parmesan one. Again, we split into two groups and one group makes each risotto. My team make the mushroom one. 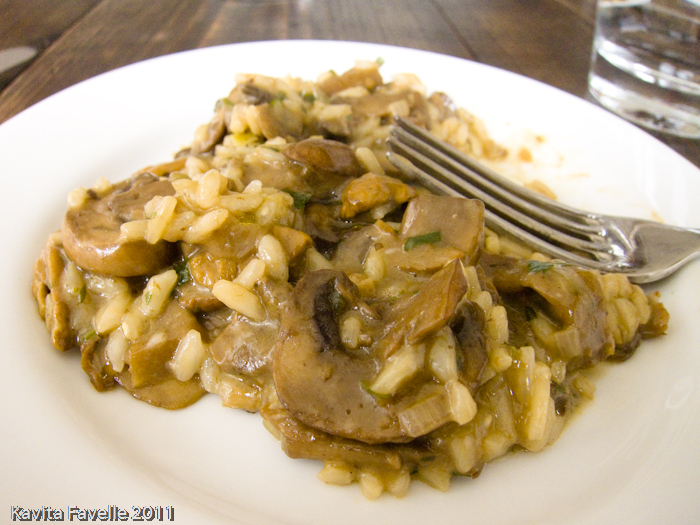 Pete and I often make risotto at home – simple recipes using home-made chicken stock and adding either home-grown leeks with blue cheese or leftover roast chicken meat with spring onions. As soon as the risottos are ready, we grab plates, serve ourselves and sit down at the big kitchen table. By this time, I’m absolutely starving, so the hot, filling risotto is very welcome indeed. And whilst the thrown-together ones Pete and I make are always tasty, I admiringly admit that these two are definitely better! The course is running late – it’s a new one and Anna says she may have been over-ambitious about how much we could achieve in the time, so rather than cooking the pasta together and sitting down to eat at the table, Anna quickly demonstrates a mozzarella, basil & cherry tomatoes sauce and a gorgonzola, spinach & walnuts one, which we quickly taste, standing around the work station. We are also invited to take some of the filled pasta with us to cook and enjoy at home. 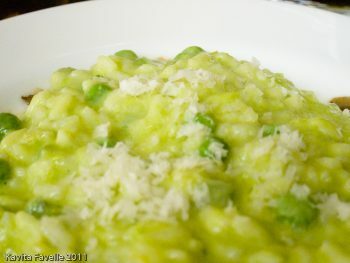 And of course, we leave with all the recipes for the pasta and risotto we have made during the day. 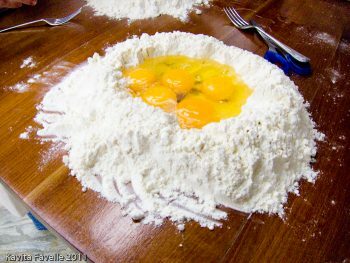 Fresh pasta dough can be made with just flour and water, or with a mixture of eggs and water, with whole eggs and/or egg yolks. The more egg you use the easier the dough will be to handle and cook, and the more yolks you use the richer its golden colour will be. Use genuinely free range eggs, as it is the hens’ diet of green things which makes their egg yolks orange. 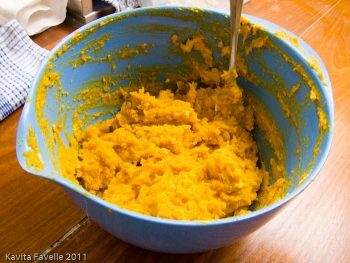 If you don’t have special ‘OO’ pasta flour (which is very fine, with a high protein content), you can use regular plain flour and the recipe will still work. Mound the flour onto a clean work surface and create a large well inside so it looks like the crater of an exploded volcano. Crack eggs and the extra yolk into the well and add a generous pinch of salt. Use a fork to whisk the eggs, then start bringing in the sides of the crater and incorporating flour. Keep mixing until you have a thick paste. At this point it may be easier to use your hands to knead in the remaining flour. Incorporate as much as possible – you want a stiff, smooth dough. If it seems too dry, sprinkle over a little water using your fingertips. 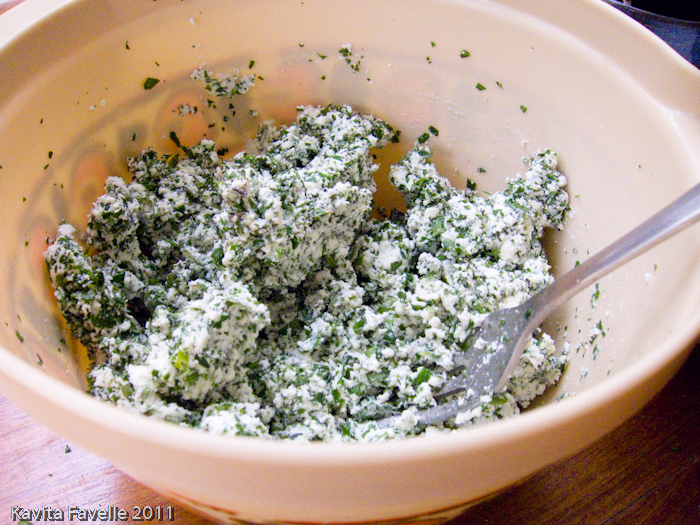 Knead for 10 minutes – it will become smoother. Cut the dough in two and wrap each piece tightly in clingfilm. Set aside for 30 minutes. If you like, you can make the dough several hours in advance, even the night before, in which case keep it in the fridge. Assemble your pasta rolling machine and unwrap a piece of dough. Lightly dust a large area of work surface next to the machine with flour. Squidge the dough into a rectangular block, with one end tapered so that it can fit into the machine. Dust it with a little flour. With the machine set to its widest setting (usually 1), roll the dough through. Fold it in three like a business letter, prod it all over with your fingertips to seal, and repeat the process, feeding one of the open ends into the machine first. Keep repeating until the dough is smooth and silky. If it is sticking to the rollers you need to dust with more flour. If it is cracking up it may be getting too dry and you should use less or no flour. Now feed the dough through each of the settings, getting thinner each time, until you get to the thinnest (usually 6). You only need go through each setting once, and this time don’t fold the dough between rolls. You should end up with a long, thin sheet of fine pasta, the width of the machine. Sprinkle plenty of semolina on a lined baking sheet. Cut the pasta into your desired shape and store on the baking sheet dusted with extra semolina so that the pieces don’t stick. Cover with clingfilm and let rest for half an hour before cooking. Or keep it in the fridge and use within a day or two. Bring a large pot of water to a boil and season generously with salt. 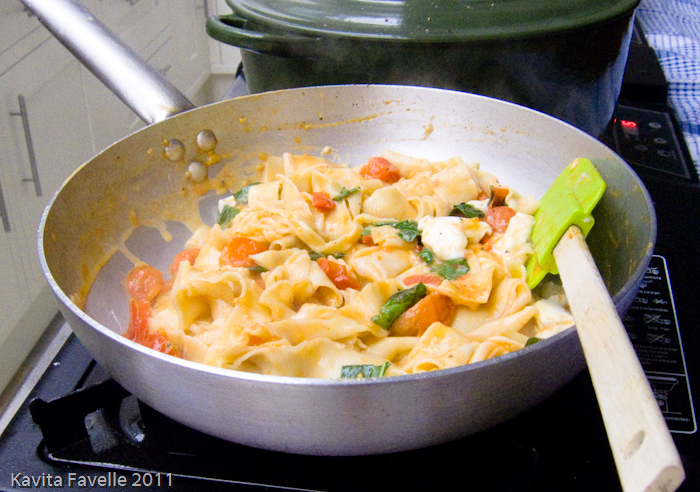 Shake any excess semolina off the pasta and boil until al dente – usually just a few minutes. Unless your pot is huge you may need to do this in batches so as not to crowd the pasta. Drain pasta and let steam dry for a minute to remove excess moisture. Toss with your prepared pasta sauce or simply drizzle with extra virgin olive oil or meted butter and grind over some black pepper. I really enjoyed the day and learned a great deal. 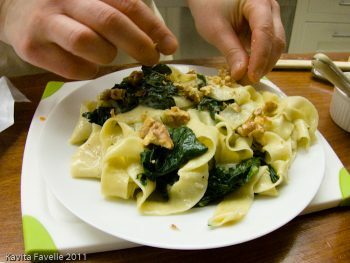 My fellow students were similarly delighted, and we all left with a new confidence in making pasta at home. I particularly appreciated the small class size and the personal instruction it afforded. Find out about upcoming classes at Anna’s website. Kavey Eats was a guest of Hubbub and the Culinary Anthropologist. 9 Comments to "Learning To Make Pasta With Recipe for Basic Fresh Egg Pasta Dough"
oooh, how lovely Kavey. I've been thinking so much recently about making my own pasta and this looks like a lovely way to start to do it. I love your paprdelle they looks scrummy… I love the fact that she taught you sauces and fillings too, very informative…. hungry now. Hey Dom! Yes it was a great introduction! I would have liked an extra hour or two so we could have more time to sit down and eat the risotto and also time to cook and eat the pasta sauces ourselves, but what time we had was great, learning to make and work the dough was excellent. I've not attempted making my own pasta yet. This class looks amazing. Will give the recipe a go. Wonder if it will work without a pasta machine? There are so many things to learn and only one stomach :-(! It sounds fabulous Kav, I am sure you will make pasta for me one day, hint, hint ;-)! Now I'm hungry!! Make my own pasta every now and then but always make a soft dough. Will have to try this method. May, you would need to roll it flat by hand and I guess repeat it a number of times? Mum, I'm sure I will, one day! Chris, I was surprised at how hard the dough was at the start, not dry exactly, as it did hold together, but hard hard hard and tough to knead! HH, definitely do a class, it gives you confidence about what you're aiming for! Kavey, you make it seem so easy. Inspiring fillings, simple dough (lots of eggs I like). Just need to find that pasta flour now..
Louis, it was Anna who made it seem easy, and actually, we found, with the guidance, that it was!